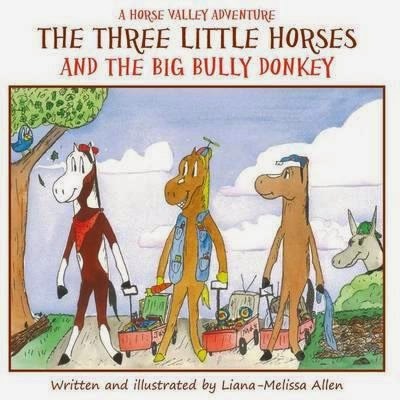 "The Three Little Horses and the Big Bully Donkey" is a tale (based on the "Three Little Pigs"), about three little horse brothers who suddenly lose their house that is destroyed by a fire. The young horses are totally alone and thrust into the reality of having to depend on themselves and each other against a bully donkey, who wanders the forest wrecking homes and bullying the other animals. This warm-hearted tale promotes strong values and has a fun premise. Written and humorously illustrated in vivid color throughout by Liana-Melissa Allen, the story is a proven winner for reading aloud to children. This book was a super fun updated version of The Three Little Pigs. What can I say? The illustrations were fantastic, the story had a much happier ending and it's perfect to be read to children or read by middle elementary age kids. I loved that the story gave multiple chances to be used as a teaching tool (fire safety, the benefit of doing things right the first time, etc). This is going to be another book that goes into the future little brother pile for the boys. We're down to only about 7 weeks before he's due to join their family and we're having fun finding the perfect books for them to share with him. Thank you again for your nice review of my book.